One of my sweet daughters Chantri . . . is giving a special friend a Baby Shower. She had so many things to do, so I offered to make the little Mini cupcakes. Her colors are bright pink and lime green, which made the cupcakes colorful & happy. 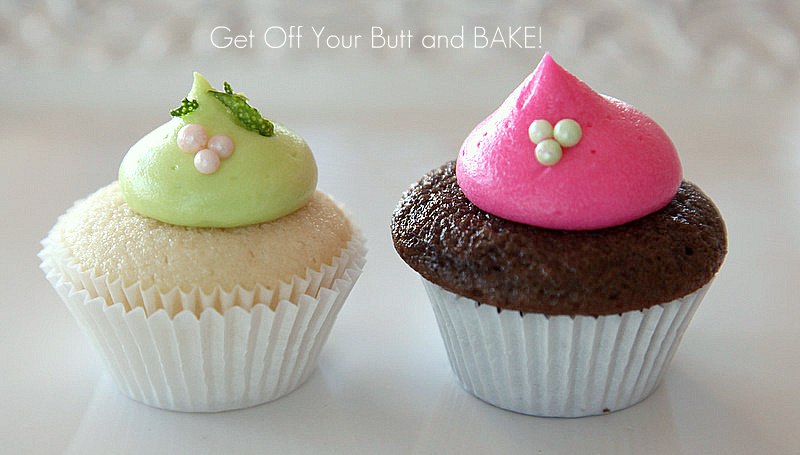 Vanilla Bean Cupcakes with Raspberry or Lemon Filling & Key Lime Butter Cream Frosting. Chocolate cupcakes with Raspberry or Marshmallow filling & Cheese Cake Cream Cheese Frosting. The inside is quite yummy. Some of the Key Lime Cupcakes have a lemon Curd filling as well. You will just have to trust me here. FYI: Look closely at some of the cupcakes. Notice how a few of them have darker edges than others? This happens when you fill the liner a bit too full. Remember that! It’s difficult to fill mini’s tins. It just doesn’t take much batter at all. Fill them 2/3 full and that’s all! 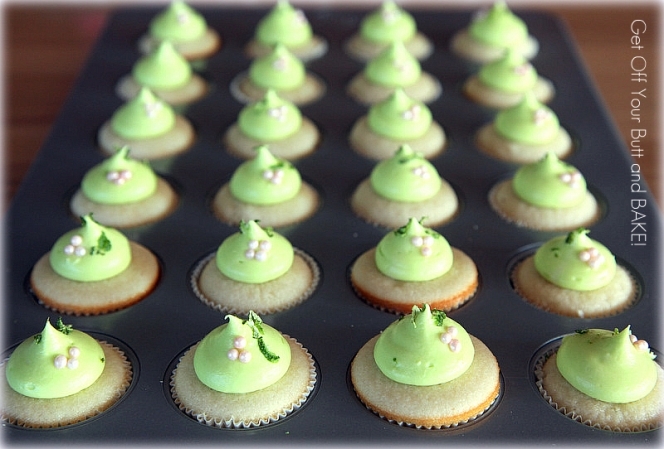 I topped these with Lime zest and little pink pearls. The Swiss Buttercream is really yummy, and you can flavor it anyway you like. Rush’s in I.F. has every flavor of Oils under the sun! For this frosting, I used the juice from 2 limes, but also made it a little zippier with Key Lime oil. 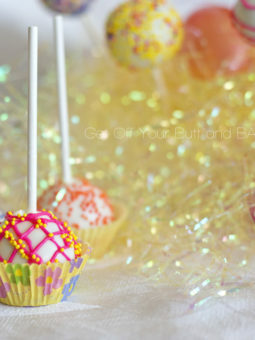 The Bright Pink cupcakes are filled with Marshmallow or Raspberry. Again . . . I gave up after having to eat a dozen of them. I made Cream Cheese Frosting, and flavored it with Cheese Cake Oil. The Oil flavoring are really nice, because they are concentrated and you don’t have to use very much at all. Add a small amount at a time. You can always add more, but you can’t take flavor away! 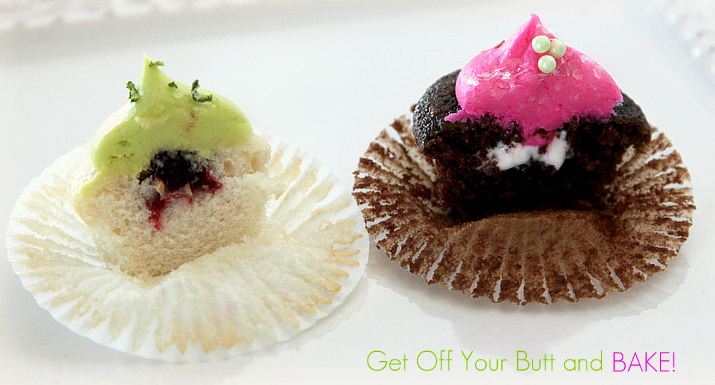 If you want to make your own sweet little cupcakes, here are my recipes. 3. Put the sugar and lemon zest (opt) in a mixer bowl or another large bowl and rub them together with your fingers until the sugar is moist and fragrant. Add the butter and, working with the paddle or whisk attachment, or with a hand mixer, beat at medium speed for a full 3 minutes, until the butter and sugar are very light. Beat in the extracts, then add one third of the flour mixture, still beating on medium speed. Beat in half of the milk-egg mixture, then beat in half of the remaining dry ingredients until incorporated. Add the rest of the milk and eggs, beating until the batter is homogeneous, then add the last of the dry ingredients. Finally, give the batter a good 2-minute beating to ensure that it is thoroughly mixed and well aerated. Place the batter into the cupcake tins. 4. Bake for 18-22 minutes for standard cupcakes and 10 to 12 minutes for mini’s, or until the cupcakes are well risen and springy to the touch – a toothpick inserted into the centers should come out clean. *This recipe made about 72 mini’s, and will make about 30 standard. 2 teaspoons of pure vanilla. *Add additional Oil flavorings if you like. Using a kitchen Aid or good hand mixer, whip the butter until it’s light in color. Add the Cream cheese and whip again until very light. Add the confectioners Sugar one cup at a time, beating continuously. Add Flavorings and whip again. (If you fill that it’s not quite the right consistency for you, add a bit of heavy Cream to thin it, or more sugar to thicken it. You can also make this ahead of time, and keep in the fridge. When you are ready use it, let it come to room temperature, and whip again. Use Gel or paste colors . . . not liquid. Flavor with Oils. Coconut, Key Lime, Huckleberry, Pomegranate, etc. * I love this frosting, because it’s not super sweet, and you can add any flavoring that you choose. There is an excellent video tutorial on making this frosting. Watch it and then make it! It’s good. Combine the egg whites, salt and sugar in a mixing bowl and place over simmering water. Continuously beating with a whisk, heat until egg whites are hot and all the sugar is dissolved (~140 degrees). If the sugar is not completely melted, your final product will be grainy, so make sure! Remove from the heat and place on the mixer. Whisk on medium speed until meringue is stiff, and the mixing bowl is cool to the touch. The meringue will be white with a bright sheen, and very sticky! Switch to the paddle attachment, and on medium speed add the butter a few cubes at a time. Please note, if the meringue is not completely cool, the butter will melt instead of combining evenly. Increase speed to high, and beat until smooth. Flavor with Oils. Coconut, Key Lime, Huckleberry, Pomegranate, cheese Cake, etc. Wow these cupcakes looks so festive and delightful. I love the bright colors. Everything you make looks beautiful! I absolutely adore your site! I discovered it while home recovering from my 12th surgery, and it was a little bit of heaven and escape to look through all the delicious recipes. It even got me out of bed to bake some of them once I was ready! 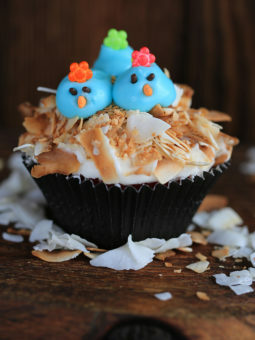 Since March I have been using these cupcake recipes, and receive rave reviews each and every time! 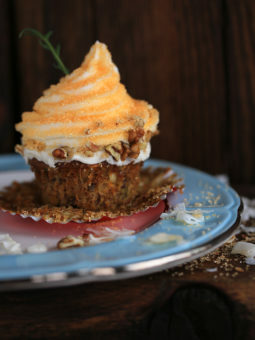 We have some pretty amazing cupcakeries here in the Orange/LA county areas, and people who have tried these cupcakes still insist they are the best they’ve ever tasted. I always feel proud to have made them, but have to give all the credit to you! Thank you for providing us with truly delicious recipes, gorgeous photos, and for sharing a piece of your life with us. I am looking to bake the vanilla cake for my boyfriend’s birthday this week. 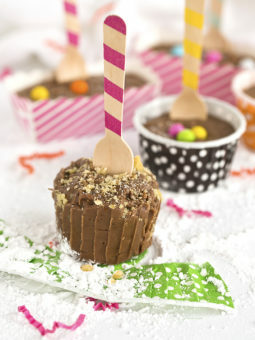 Until now, I have only used the recipe for cupcakes, but would like to make a true cake this time. I was wondering if this recipe will fill two 9 inch round cake pans. I’m thinking it will, but just want to be sure. I was also wondering how long to bake them for? I used paper liners . . . did you? Oh boy especially with mini’s. If you don’t use liners you must quickly go around the edges with a knife to loosen the cake carefully before removing.